As far as the north of Thailand goes, most Thailand itineraries put the emphasis on Chiang Mai. This makes sense as Chiang Mai is a large yet charming city with a great number of attractions. For most people, I think Chiang Mai is the place to go. But Chiang Rai, which is further east, had plenty to offer as well. 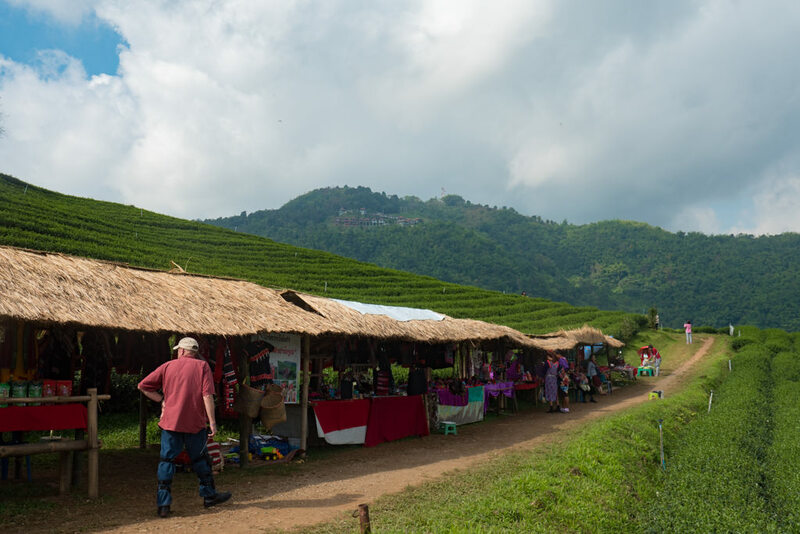 The city itself is not as buzzing, but the surrounding province has some nice highlights — from hill tribe treks and mountain-top views over the Mekong to scenic villages among the tea fields. Their names might be just one letter apart, but these two cities are quite different from each other. Chiang Mai has a population of over 1 million (within the greater Chiang Mai area) which makes it the largest city in northern Thailand. Fortunately, it doesn’t feel overwhelming — Chiang Mai is very green, low-rise, and pretty. Its center is bounded by an ancient city wall and moat, creating a very walkable downtown area that invites random exploration. Chiang Mai is both budget-friendly and cosmopolitan, with many hip cafes, an artsy scene, and many international cuisines available. This has made it a favorite not just with tourists but also with expats from around the world. You can read about some of the best things to do in Chiang Mai. 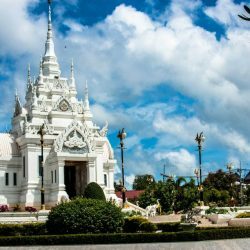 Chiang Rai has around 200,000 inhabitants, making it about a fifth the size of Chiang Mai. There isn’t much nightlife to speak of, but you might like its low-key vibe. 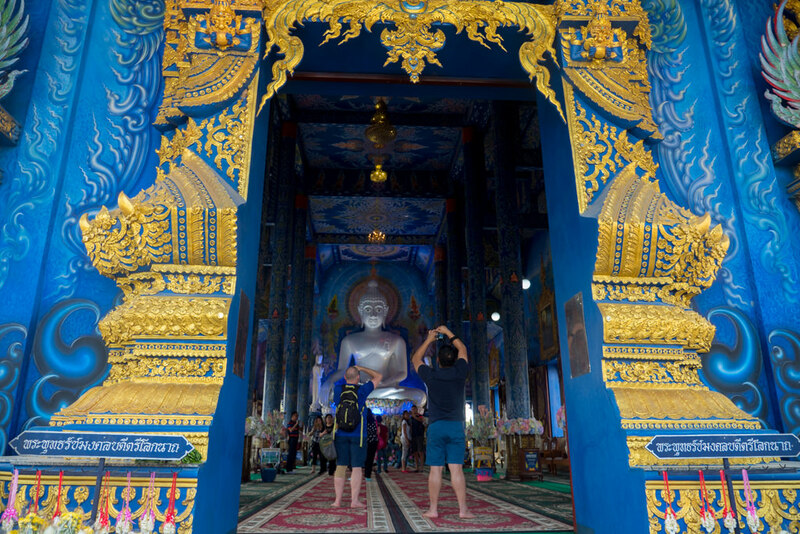 It has some small museums, a night market (much smaller than Chiang Mai’s), and several unique (and very touristy) contemporary Buddhist temples. 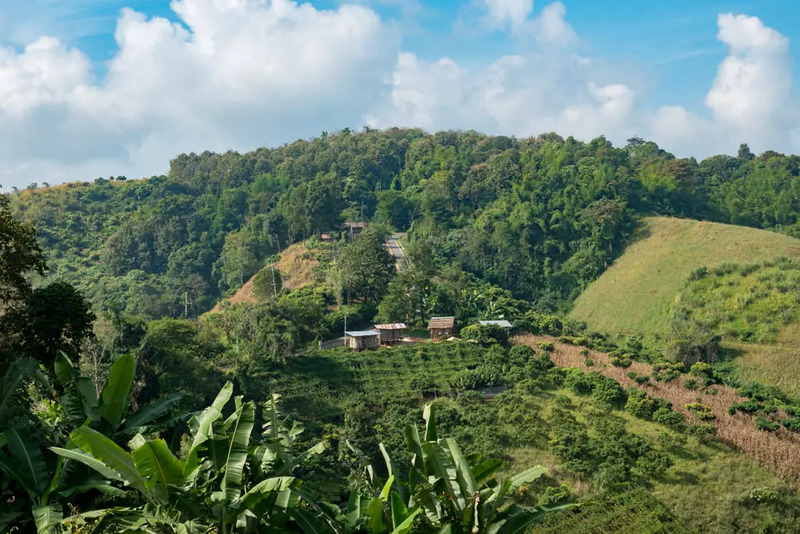 Chiang Rai is arguably best used as a base for exploring the surrounding province — since there is less traffic and less sprawl, it’s a bit easier to dive straight into the countryside. 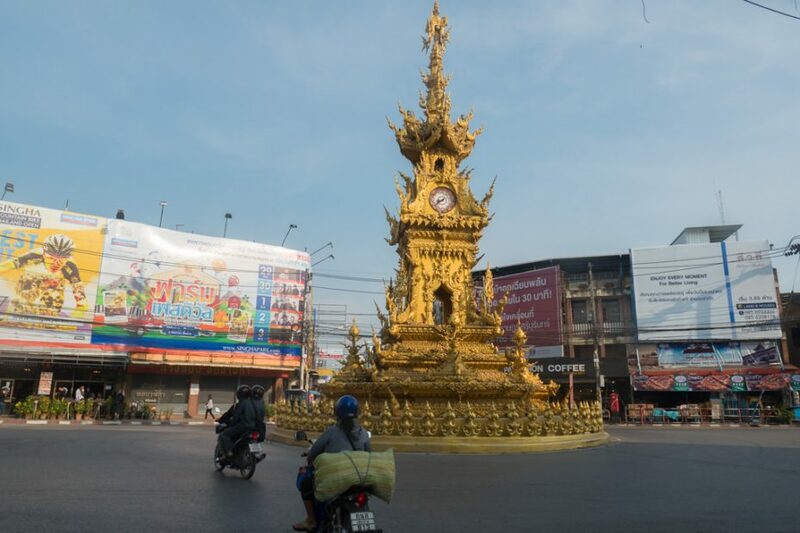 Compared to Chiang Mai’s more walkable and clustered city center, Chiang Rai’s layout feels less cozy and a bit more dispersed along several arterial roads. Which one to visit? If you are a first-time visitor to Thailand with limited time then you probably don’t want to skip Chiang Mai. It has broader appeal and can keep you busy for many days! 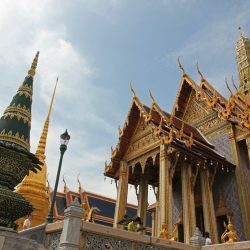 It has a buzzing city life, good day-trips nearby, and it’s also known as an excellent place to learn things (as there are so many Thai cooking, Muay Thai boxing, and Buddhist meditation classes available). I probably recommend adding Chiang Rai only to your itinerary for a night or two (or more) if you’re traveling around Thailand and aren’t short on time. Chiang Rai is also a good stepping stone towards Laos if you’re heading that way, as it’s just two hours from the border. The accommodation options in Chiang Rai have much increased in recent years. I remember coming to Chiang Rai for the first time a few years ago and there being only two or three listed hostels in town; now there are dozens. Below are a few suggestions for places to stay at a few different budgets. 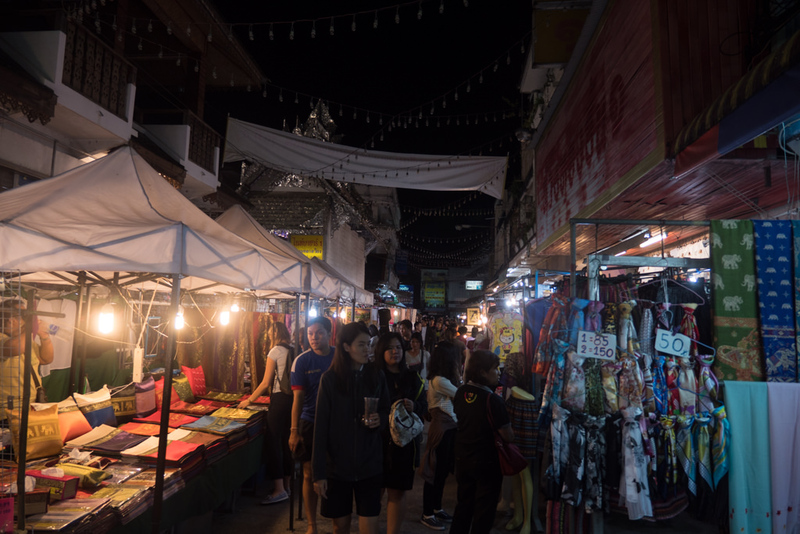 Along several streets in the center of town you’ll find market stalls selling hill tribe handicrafts, t-shirts, and other souvenirs [map]. There is also an open-air food court of sorts. This is a great place to find some snacks; try the Thai tempura or fried insects. If you want to settle a bigger appetite, you can’t go wrong with a delicious hot-pot dinner. For a more local food experience, you don’t need to go far. Just a block away from the Night Bazaar (in pretty much any direction) you’ll find plenty of unpretentious restaurants with good cheap eats; I took a seat in one with a CRT TV playing bad karaoke videos. 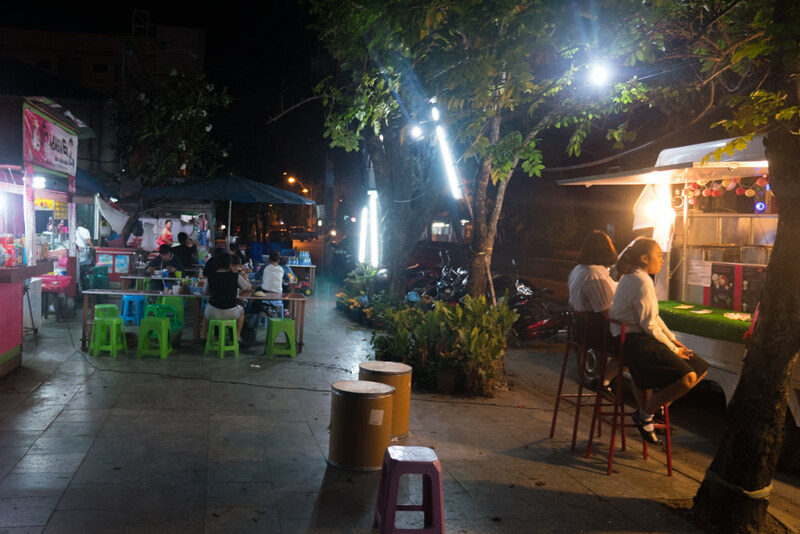 There’s also a tiny food market on Thanon Banphaprakan [map]. 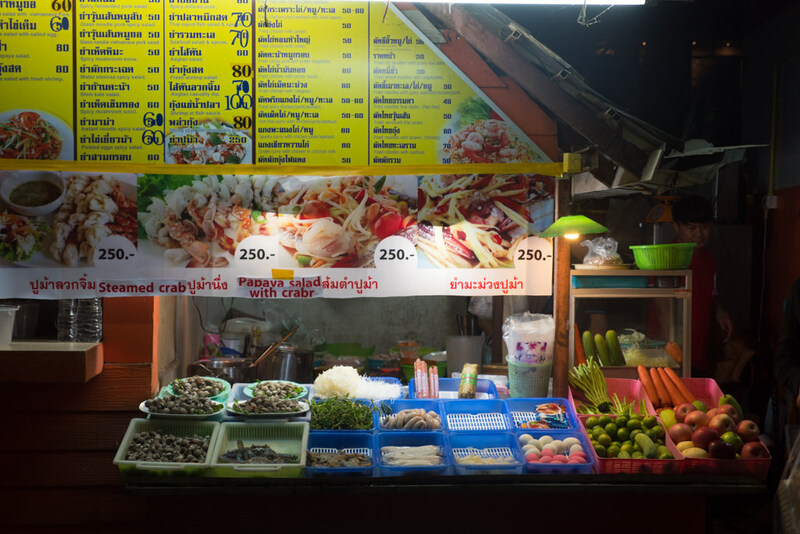 English wasn’t spoken here when I visited, so you may have to resort to pointing at things to order them, but you’ll be sure to get a true Thai street food experience. I know… sigh, more temples! But even if you’re suffering from temple fatigue, you may wish to give these unique ones a look. 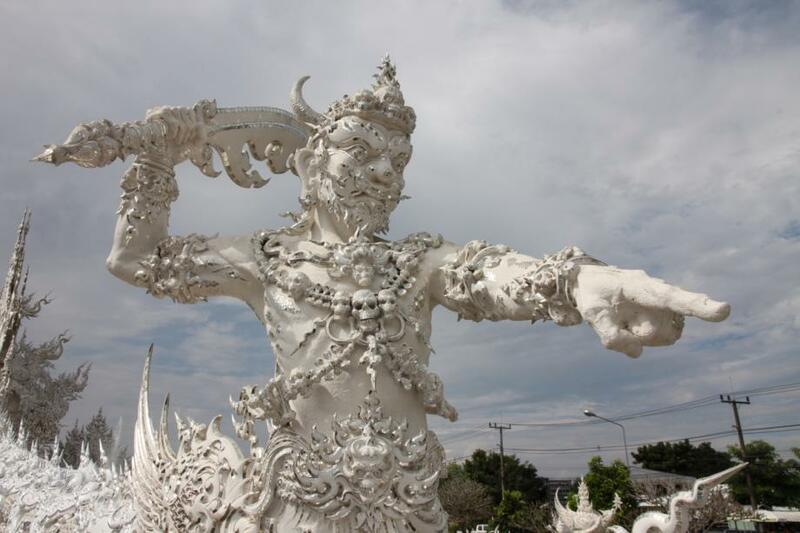 The White Temple is the brainchild of a Thai artist who began its construction in 1997 (and it is still ongoing). At first glance, it appears to be just a majestic and gracious Buddhist temple… but look at the details, and you realize it’s also kind of insane. Why is there a mural featuring Hello Kitty and Neo from The Matrix? Why does the garden have a sculpture of The Predator? It turns out there is real symbolism intended — it’s all meant to be a reflection on modern life — but this intention isn’t always so clear. It’s beautifully crafted, but also kitschy and bizarre. The artists’ protege has since started the Blue Temple, still under construction but with the main hall now completed. It is a fine display of contemporary Buddhist art and architecture, with a style less brazen than its antecedent. It can be seen on a shorter visit. The black house is technically not a temple, though it looks a lot like one. Part art studio and part museum, it’s the creation of another local artist and offers a different interpretation of Buddhist philosophy using darker imagery and motifs. 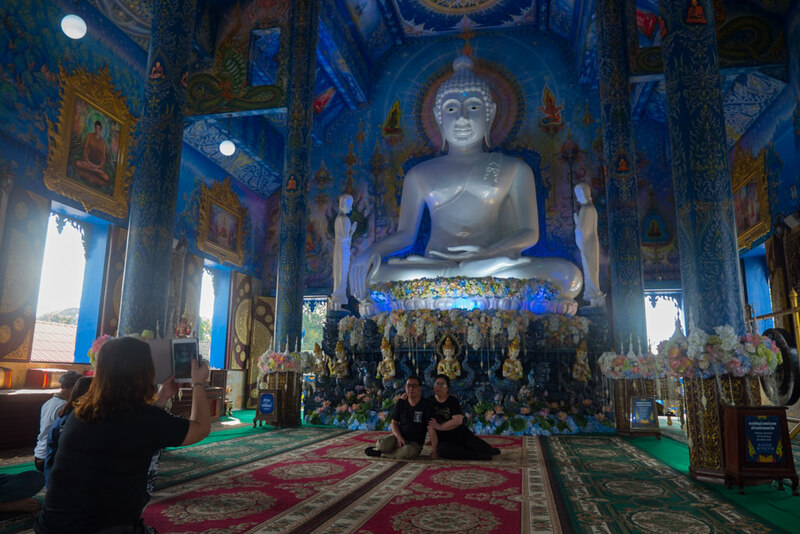 All three locations are worthwhile but they are definitely tourist traps, with tuk-tuk drivers peddling white/blue/black tours everywhere and many touring buses delivering large groups to each site. Early morning or late afternoon visits might help you beat the crowds. Embrace your inner cat lady or… cat gentleman (?) at Cat ‘n’ A Cup. Here you can enjoy a nice cup of iced or hot tea or coffee while petting some fluffy friends. Loved by locals and visitors alike, it’s a great place for the weary traveler to wind down. 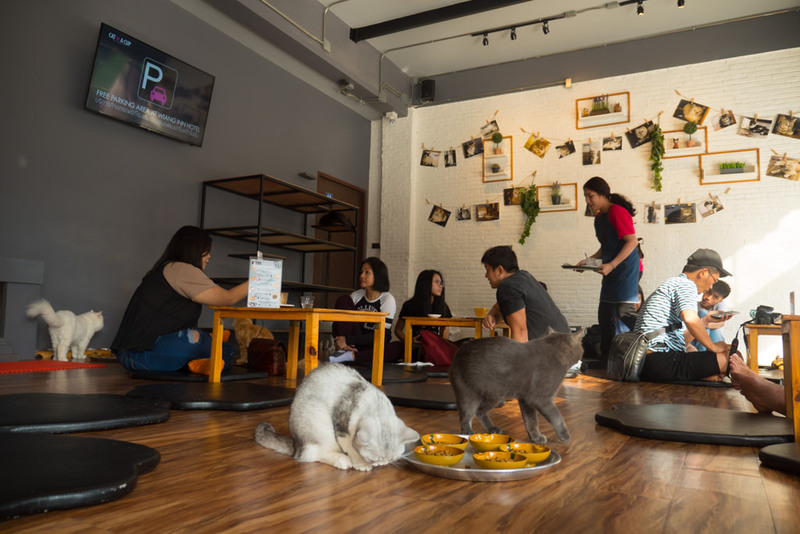 A cat café may not be unique to Chiang Rai, but I loved coming back here after some sightseeing. I think this village is one of the nicest attractions near Chiang Rai. 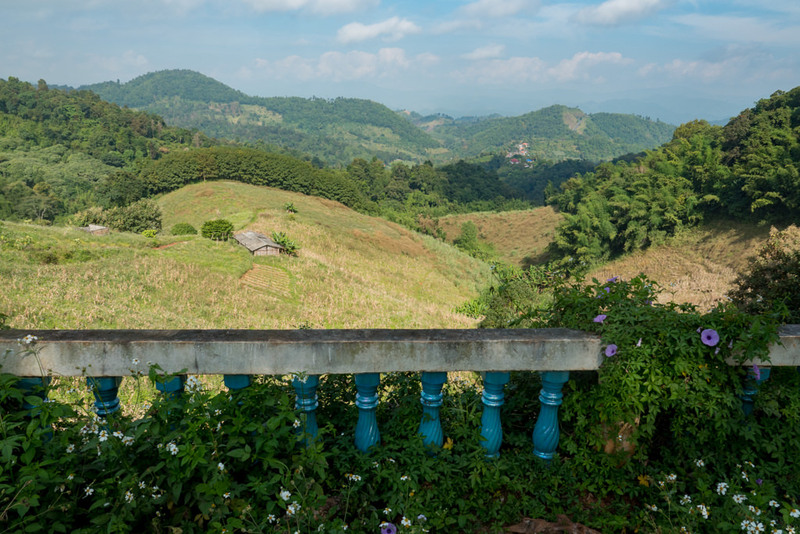 Settled on a mountain rim, Mae Salong (also known as Santikhiri) offers panoramic views of the green valleys below. 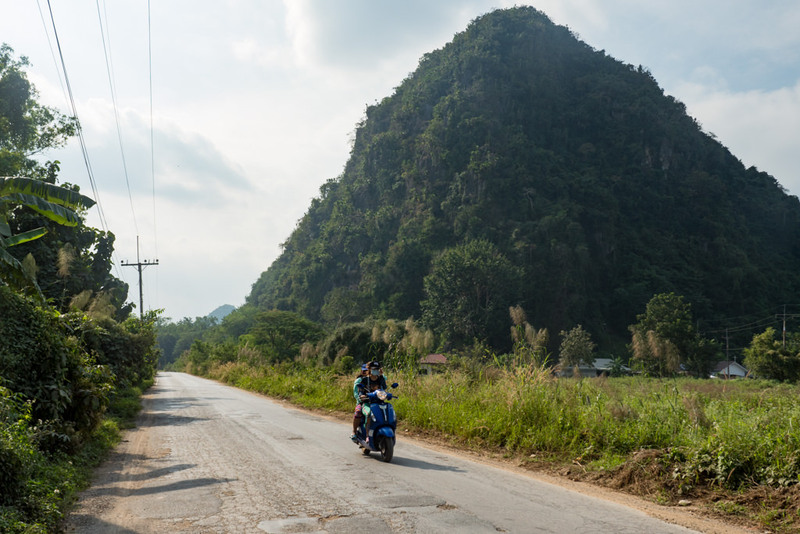 There isn’t that much to do in the village itself, but the windy roads leading up to Mae Salong are very scenic. It’s best to drive there yourself and to visit on a clear day. Founded by Chinese rebels fleeing communism in 1949, Mae Salong still maintains some Chinese influences. You’ll notice the occasional Chinese lanterns and Yunnanese meals on offer. Its narrow winding streets are lined with guest houses, noodle shops, and tea shops, while a contemporary Buddhist pagoda sits on top of its highest peak. 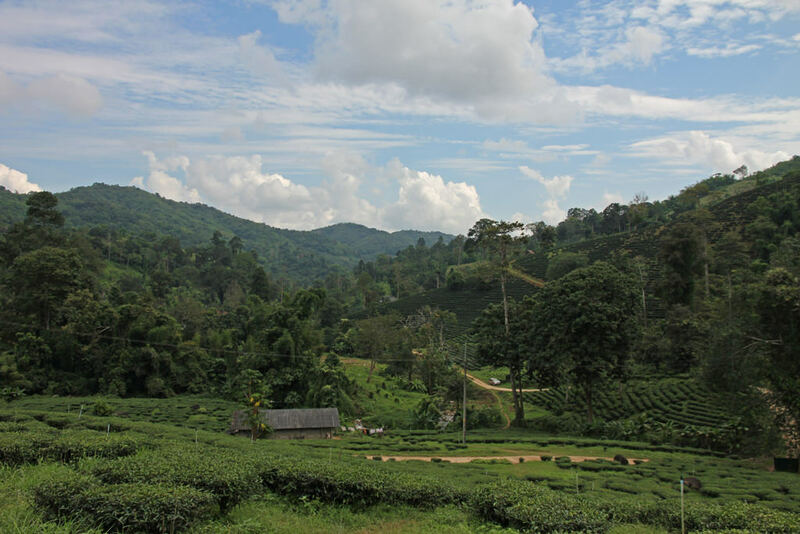 Tea plantations surround the village, some offering educational tours about the tea growing process. How to get to Mae Salong: I rented a motorbike in Chiang Rai and drove north up Highway 1 for about 40 minutes. It seemed like this big road might be scary, but most scooters just putter along the emergency lane at a snail’s pace, so it was fine. Take the exit onto Road 1130 [map], which passes some villages and rice fields and then snakes its way up the mountains for another hour or so. There are also scheduled buses and songthaews from Chiang Rai, but I think having a little road trip is more fun. I also met another traveler who hitchhiked her way to Mae Salong, which seems like another great way to get there. About two hours east of Chiang Rai and along the border with Laos sits a 60 km long mountain range that gives unbroken views of the valleys and the Mekong river below. The best views are at sunrise when the lower reaches are shrouded in a gorgeous sea of mist. The viewing point at Phu Chi Fa used to be hardly known but has become a veritable festival of selfie-sticks, despite it being a little difficult to reach (at least using public transportation). The view is spectacular though count on there being many people, and you have to be lucky with the weather of course. I didn’t manage to capture good photos but you can get a great impression from this or this blog. There are some alternative quieter viewpoints: locals told me of Phu Chi Dao, Doi Pha Tang and Phu Pha Sawan, though getting there may take a bit more determination. They’re easiest to get to if you have your own vehicle. How to get to Phu Chi Fa: at the time of writing (2018) this is not something you can do with a cheap/convenient backpacker tour. If you want to be there by sunrise starting from Chiang Rai, your only way is to get a private taxi very early at night. Your guesthouse or hostel may be able to help you book such a ride. Otherwise, there’s a 13.00 bus service from Chiang Rai to Phu Chi Fa, with a return every morning at 09:00. There are some homestays and guesthouses at Phu Chi Fa where you can stay for the night. I did a one-day hill tribe trek in the Mae Kok region northwest from Chiang Rai, which was a good experience. 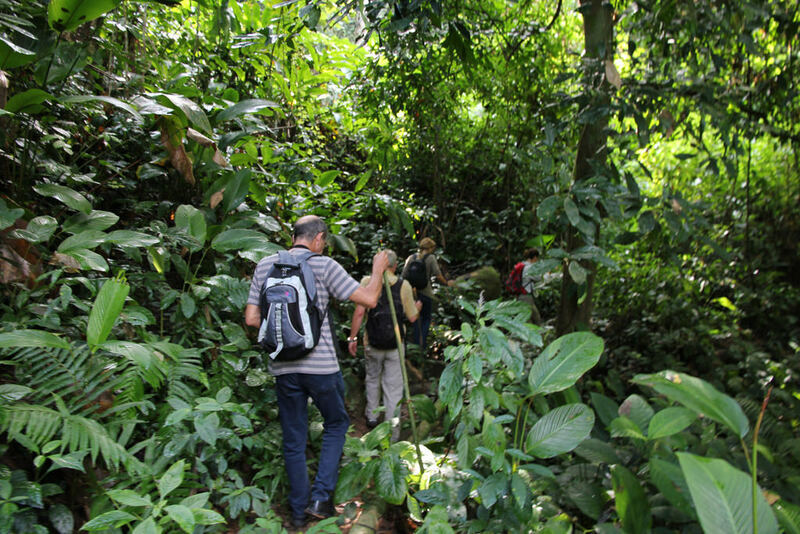 You’ll walk through hilly terrain and some secondary forest, with a pit stop for lunch at an indigenous tribe village. Multi-day treks include sleeping in a homestay in one of these villages. The landscape here is partly agricultural, so if you’re looking for raw wilderness then perhaps the Nam Kan National Park in Laos is a better bet (if your travels will take you there). I think the karstic mountains in the Mae Hong Son province in northwest Thailand might also be a bit more scenic for extended treks. Nevertheless, I really liked my trek near Chiang Rai. The area definitely seems worthwhile especially when accompanied by a knowledgeable guide. Various local companies based in Chiang Rai offer organized treks. A nice way to spend an afternoon is to rent bicycles or motorbikes and head northwest along the Kok river. You can find details of this route at Travel Fish. 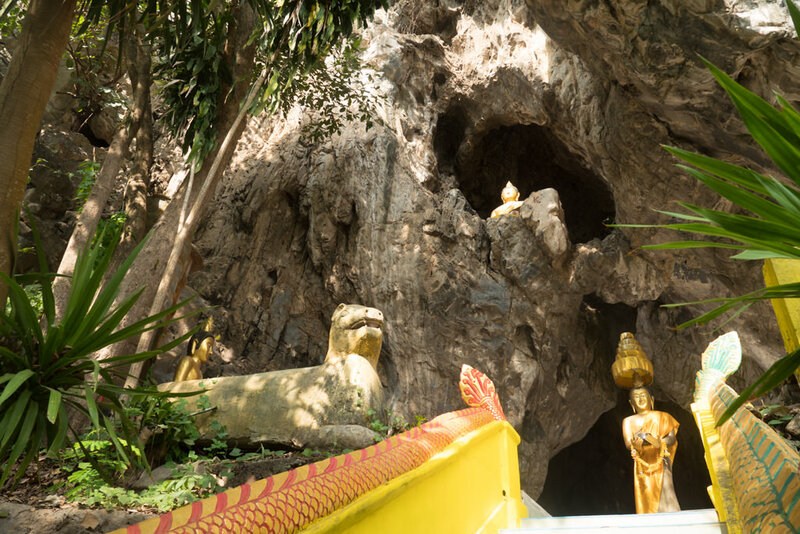 I enjoyed making a stop at Wat Phra That Tham Doi Kong Kao (yep, it’s a mouthful), a Buddhist temple built inside a cave. Inside you can admire several shrines. Be sure to also keep your ears tuned for the clicking and chirping of some resident bats. When I first went down this route back in 2012, things were different. You had to cross the river on a rickety wooden ferry, survive chaotic scenes at the immigration office which had just a single counter, and then switch to a bus or slow boat in Huay Xai. Following the construction of new roads, a bridge, and modern immigration facilities, it’s all a lot easier. There are many domestic buses from Chiang Rai to the border town of Chiang Khong, and an international bus that crosses the border to Huay Xai in Laos (look for signs saying “Bokeo”, which is the name of the province). A night bus also goes all the way from Chiang Rai to Luang Prabang, though I think it’s a shame to do this at night, as Route No. 3 through Nam Ha National Park is incredibly scenic. Consider whether you want to travel to Luang Prabang by bus or by slow boat. I’ve done both and they both have their charms. You can read my comparison between traveling by slow boat or bus. 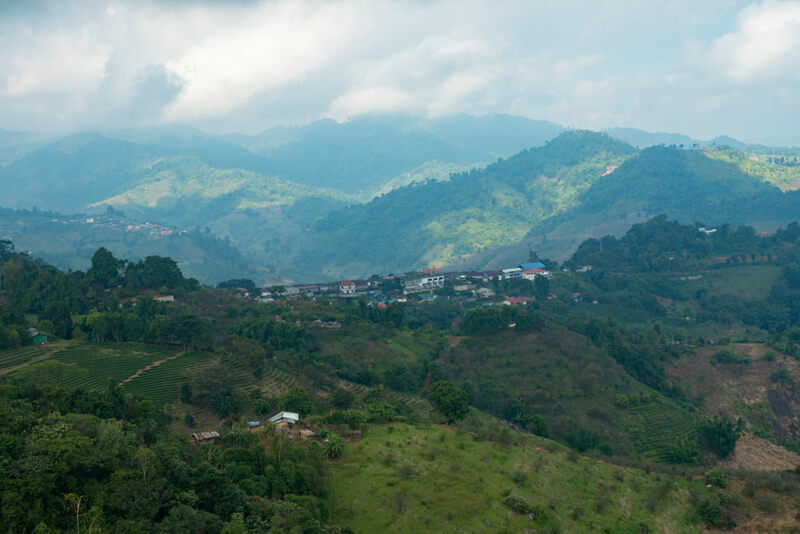 What tour agency did you use for the one-day hill tribe trek in the Mae Kok region? Don’t remember, sorry. There are tons of tour agencies in town. Amazing blog! It will help me a lot with the itinerary! Love your blog posts as always. Do you think I’ve given myself enough time for Pai? I am going to book ahead the accomodation at Phu Chi Fah, otherwise my whole SEA trip is just going with the flow. For Pai it just depends what you like… it’s a small place that’s mostly a bit of a backpacker and tourist hangout, but there a plenty of fun little things to see around the area. I probably wouldn’t worry too much about it… your itinerary doesn’t seem rushed. Stop making Chiang Rai more touristy. Just stop, your going to ruin it and all it’s charm. It was the best keep secret till you just messed it up with this article. My intention here was to write a pretty neutral informational article! 96% of the readers come to this page already searching for Chiang Rai. 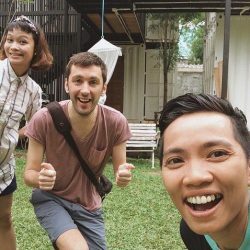 I think Chiang Mai is actually the more logical place to go for most people.